Research into the causes of and treatments for mental disorders is going on all over the world. And researchers are always looking for people who want to participate in their studies. WeSearchTogether (wesearchtogether.org) is a consumer clearinghouse of information for depression and bipolar disorder research that was created by the University of Michigan Depression Center and the Depression and Bipolar Support Alliance. The clearinghouse connects people living with mood disorders who are considering participating in research with researchers exploring a range of topics related to depression and bipolar. WeSearchTogether is easy to navigate and you don’t have to register to browse through the studies open to participants. Studies are divided into observational, which do not offer any treatment-related options, and those that are treatment-oriented. I entered my demographic information and found a wealth of studies that are within 25 miles of my home. Some required no travel at all. Many studies offer compensation of some kind; cash or gift certificates are common. 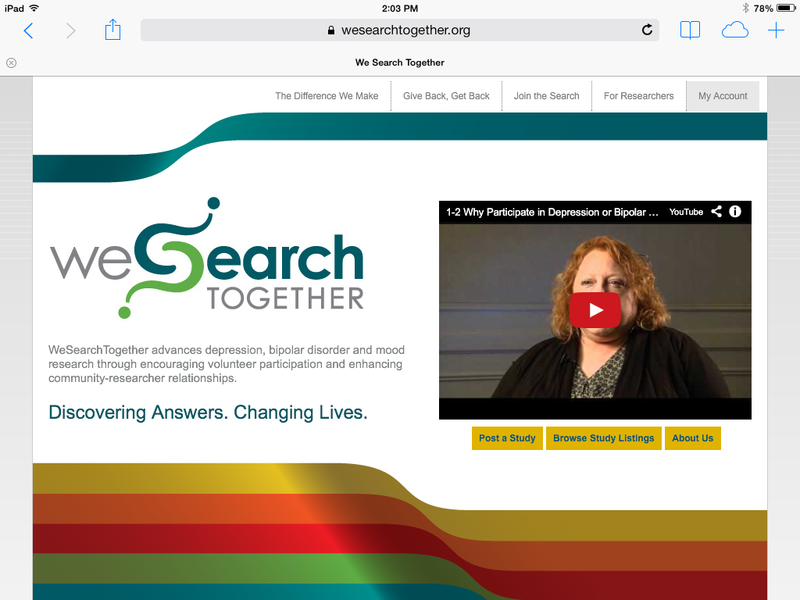 The WeSearchTogether has abundant information to answer just about every question you might have on why and how to participate in mental health research. In addition to written information, there are videos of patients and professionals explaining participation and the value of research in understanding neurodiversities. I found two studies that were intriguing that I’m going to look into joining. One studies the impact of having a family member with depression or bipolar disorder; another explores how people with depression use Facebook. Head on over to WeSearchTogether and see what might interest you. ← Calling all bloggers. Guest posts needed! This is great, Janice! I’ll have to have a look. I know! Some of the study titles alone are worth a browse.